I-tip pre-bonded hair extensions is also named stick pre-bonded hair extensions, I-tip fusion hair extensions, i-tip keratin hair extensions. The pictured I-tip hair extensions is Hera straight #2 dark brown Brazilian virgin pre-bonded hair extensions. 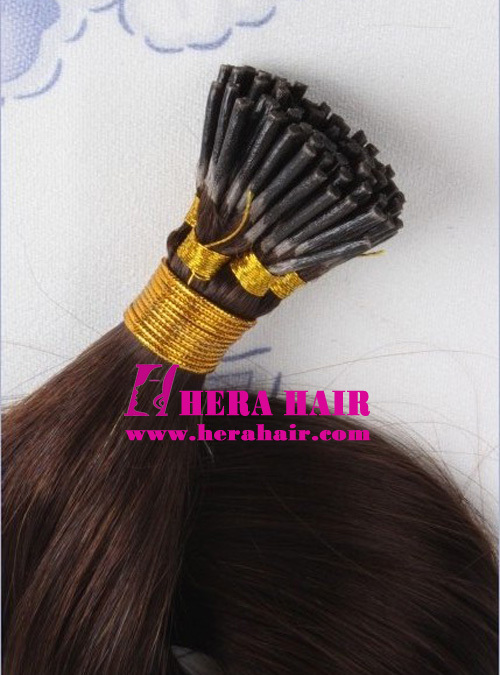 Hera is the best I-tip Brazilian virgin pre-bonded hair extensions wholesaler and supplier in China. Except Brazilian virgin pre-bonded hair extensions, Hera also supply Indian virgin pre-bonded hair extensions, Mongolian virgin pre-bonded hair extensions, Malaysion virgin pre-bonded hair extensions, European virgin pre-bonded hair extensons, Chinese virgin pre-bonded hair extensions etc. If you want to do light color I-tip pre-bonded hair extensions, you should choose virgin hair materials, such as Brazilian virgin hair and European virgin hair etc. are very good choice. Normally speaking, Hera mainly supply 0.9g/strand pre-bonded hair extensions, we also can supply 0.75g/strand and 0.5g/strand I-tip keratin hair extensions (pre-bonded keratin hair extensions). Except I-tip stick pre-bonded hair extensions, Hera also supply U-tip nail pre-bonded hair extensions, V-tip pre-bonded hair extensions, Flat tip pre-bonded hair extensions etc. Personal user buy I-tip pre-bonded hair extensions, you can visit our online store by http://www.herawigs.com, which is free shipping worldwide and you can pay by Paypal.